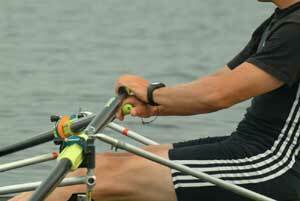 Tom Bohrer has over 20 years experience rowing and coaching. He is a two-time Olympic silver medallist (1988 and 1992) and a More. . .
For your training needs visit Perform Better. 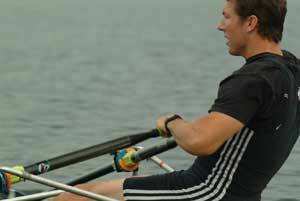 Weights, bands, stability balls, medicine balls and more..
See Tom's Rowing News articles.. Check out CHERRYPHARM, an all natural post workout recovery drink. Updates - February 2017 - Last few weeks of workouts are posted leading to the CRASH-Bs. The week before the race keep the volume low and intensity high. Just enough to keep you sharp and avoid the urge to do more work. That is what a taper is for. Nutrition/Hydration/Sleep will play in big part into having peak performance on race day. Good Luck! Coaching Tip - Here are a series of photos showing the elbow position during the stroke phase from mid-drive, finish, release and mid-recovery. Take note of the elbow height during each phase...it has not changed. During the mid-drive, I like to think of the elbows on top of a table and that height is held through the finish. The elbows can't drop below the table. 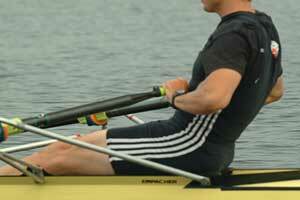 The elbows then move out from the body and the forearms stay parallel to the water. Think of drawing with the elbows as if you were opening a bag or "chips". When you to this the chest is wide and the shoulders are down and relaxed...a strong position. Then notice at the release, the wrist feathers the blade and there is a slight pushdown with the forearm to get the height off the water. Think of hinging from the elbow. The elbow is at the edge of the tabe so the height stays the same. Look this over and let us know if you have any quesitons. Keep sending us any questions about training or technique, we would like to hear from you. We answer all emails personally. If you don't hear back from us, then for some reason we did not get your email. Please use the Contact Us buttons on the top right corner of every page to reach us, this is the surest and fastest way to get a response. Frequently Asked Questions (FAQ). Have a question about training, or want to see what other people are asking then go to the FAQ section. The most recent question is how to help an athlete who opens up the back at the catch. Stroke Guide. Need to improve some part of your stroke? Here we cross reference drills, articles, photos for what ever you need to improve. Printer Friendly PDF Files. Need to print out a workout or drill? It should be easy with most content in PDF's. 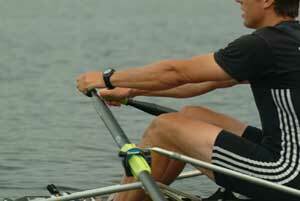 Updated Rowing and strength workouts.